Which putter is right for you? Putting is responsible for 40-50% of your score in golf, choosing the right one is critical. When deciding on a putter, there are a number of factors to consider. Probably the most important, is finding the correct length. More than half of the students I teach have a putter that is too long. When in proper setup, your eyes should be directly over the center of the ball or slightly inside. The correct position over the ball allows for a stroke that is straight back, then straight through along the target line. When a putter is too long or the golfer is not in proper position, the putting stroke becomes an arc, pushing the ball to the right or left off target. 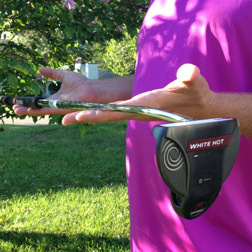 An insert softens the feel of the putt giving a golfer better distance control. How soft a putter you choose is dependent on your stroke and the type of greens you typically play. The last option is head design. Do you like more of a mallet type or are you more comfortable with a traditional style? Each of these designs has a different type of “toe hang”. What is toe hang and why does it matter? 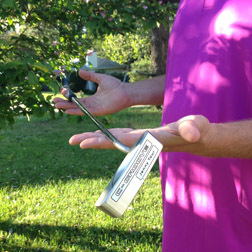 To demonstrate toe hang, with arms out in front of you, let the putter rest on your fingers without gripping. Face balanced: Putter will sit with the putter head parallel to the ground. This putter will have a large mallet head and is best for golfers whose putting stoke is straight back – straight through. Semi toe hang: Putter will sit at a 45 degree angle to the ground. This is best for a golfer whose putting stroke is a slight arc. 80% of golfers sit in this category. This is a traditional style head and helps correct the arc in the putting stroke. Full toe hang: Putter will point straight down at the ground perpendicular to the ground. 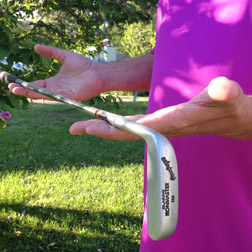 Best for the golfer whose putting stoke is a fuller arc. This is also a traditional style head and is best for people who have a hard time getting their eyes over the ball due to flexibility challenges, injury or improper set up. Golf equipment is an investment in satisfaction, let me help you make an informed choice. Your ROI will be a lovely day on the golf course. Who could ask for more?